Does anyone remember the 2012 season? Let me jog your memory: it was the last season for Chip Kelly at Oregon, it ended with one of the most entertaining games I have ever witnessed in the win over Kansas State, and it saw the beginning of the Marcus Mariota era of Oregon Football. But it started with a bit of uncertainty at quarterback. Back in the spring of 2012 there was a fierce battle occurring at QB, with Bryan Bennett expected to be the starter entering camp. 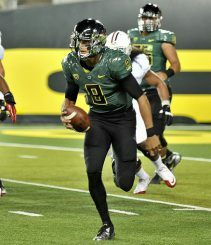 But his starting spot was eventually overtaken by a scrappy redshirt freshman who would go on to lead the Ducks to a ridiculous three-year stretch, capped off by a Heisman trophy win and an appearance in the inaugural NCAAF Playoff National Championship. That player was Marcus Mariota. Few QBs have had the speed of Mariota. There was a little bit of fan pushback due to the hype around Bennett. He had been a four-star recruit, he had one more year with the team than Mariota, and he was supposed to have a better arm. Bennett had starting experience against Colorado in 2011, and he looked extremely impressive in that game. Many fans, myself included, thought that Mariota won the job based on running ability alone. But Mariota turned out to be the better guy for the job. Bennett did have a nice career after he transferred, even entering the NFL Draft. What would have happened if Coach Kelly had played both of them? Would Mariota have risen as high as he did? Would Bennett have transferred? What are schools supposed to do when they have two starting-caliber QBs? If you asked about a dozen teams in the country right now, they would say that you play them both. For example, Clemson made the playoffs last year under Kelly Bryant, a very talented and productive QB. And yet this season he lost his starting job, and elected to transfer, because Trevor Lawrence is just too talented a thrower to keep on the bench. Transfer decisions aside, Clemson started the year running a two-QB system, even pulling Lawrence from the Texas A&M game because they didn’t trust him to win it. 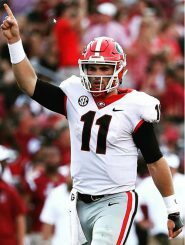 Will Jake Fromm Keep His Starting Job? At Alabama, the incumbent starter and one of the nation’s leaders in career winning percentage was unseated by Tua Tagovailoa, because of his performance in the National Championship game and his superior arm talent. Jalen Hurts is still getting meaningful playing time, but it seems unlikely that a player of his caliber will stay at Alabama as a backup to finish out his career. Georgia is probably the most interesting of the teams running two-QB systems. Jake Fromm and Justin Fields are both NFL-caliber players. The issue is that Fromm, the returning starter from the national runner up last year, is only a sophomore. He is going to start this year and, in all likelihood, next year as well. Is Fields really going to be content with not being a starter until his junior season? Is he going to unseat Fromm this offseason? Will one of them transfer? The Oregon Ducks have played five games in the 2018 season. So far they have faced nine QBs: one against Bowling Green, three for Portland State, two for San Jose State, one for Stanford and two for California. The three opponents that played multiple QBs struggled to move the ball through the air, while the two that played their named starter for all of the meaningful snaps in the game had success through the air. Sure, a lot of the throwing success could be chalked up to talent, but Cal repeatedly benched a QB as soon as they threw an interception, ruining the flow of their offense on multiple occasions. Wouldn’t it do a lot for the confidence of those players if they didn’t have to worry about being benched because of one throw? The Cal QBs threw a combined four interceptions. 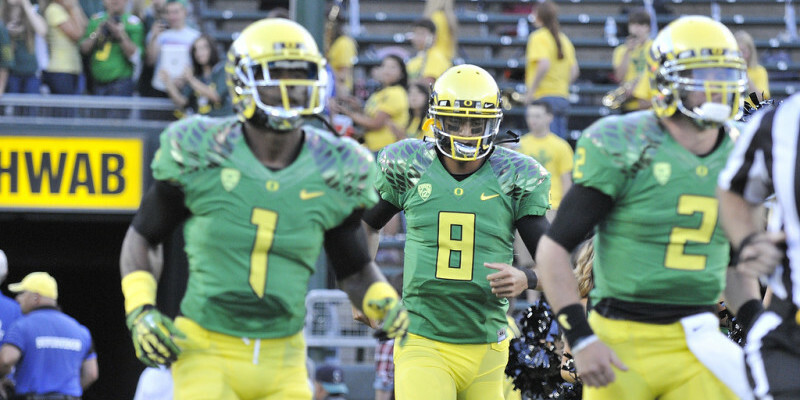 Oregon only has four interceptions combined in the other games this season. Sure, in many cases that backup is a true freshman and the future of the team. But should a coach sacrifice the confidence of his starter, risk ruining the flow of the offense, and possibly divide his locker room just to put in a guy who can run a little better for two drives in the middle of the second quarter? I would reference the Mariota vs Bennett competition and say that the answer is ABSOLUTELY NOT. Imagine if Bennett had been stealing snaps from Mariota. Would he have actually brought anything else to the offense? Probably not. The backup should be ready to play, but not at the cost of the starter. So if you’re a coach out there: have at it! Play both guys! But when neither of them is really ready to be on a big stage, and you’ve wasted one of their years of eligibility, just remember: Mariota and Bennett did not have significant separation coming out of camp either.